Invasion of the body with organisms that have the potential to cause disease. 1. invasion and multiplication of microorganisms in body tissues, especially that causing local cellular injury due to competitive metabolism, toxins, intracellular replication, or antigen-antibody response. airborne infection one that is contracted by inhalation of microorganisms or spores suspended in air on water droplets or dust particles. droplet infection infection due to inhalation of respiratory pathogens suspended on liquid particles exhaled by someone already infected (droplet nuclei) . 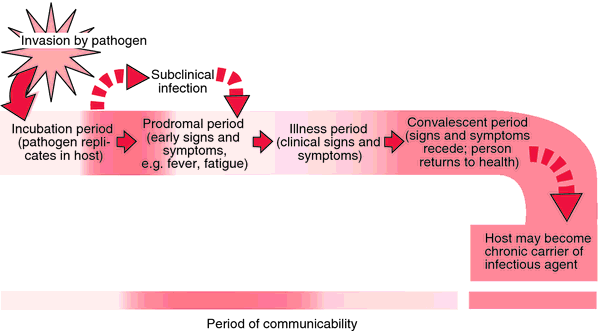 endogenous infection that due to reactivation of organisms present in a dormant focus, as occurs in tuberculosis, etc. tunnel infection subcutaneous infection of an artificial passage into the body that has been kept patent. opportunistic infection infection by an organism that does not ordinarily cause disease but becomes pathogenic under certain circumstances (e.g., impaired immune responses). 1 the invasion of the body by pathogenic microorganisms that reproduce and multiply, causing disease by local cellular injury, secretion of a toxin, or antigen-antibody reaction in the host. 2 a disease caused by the invasion of the body by pathogenic microorganisms. Compare infestation. infectious, adj. Epidemiology The presence of a pathogen in a host which may or may not be associated with clinical disease. See Acute HIV infection, Atypical mycobacterial infection, Breakthrough infection, Chronic symptomatic HIV infection, Close contact infection, Congenital CMV infection, Cross-infection, Danger space infection, Ear infection, Emerging infection, Exit-site infection, Fungal infection, HIV-1 superinfection, Hyperinfection, Latent clostridial infection, Mixed wound infection, Multiple infection, Multiplicity of infection, Mycobacterial infection, Nail infection, Nonprogressive HIV infection, Nosocomial infection, Occult infection, Opportunistic infection, Parasitic infection, Perivascular inflammation, Ping pong infection, Pocket infection, Reemerging infection, Respiratory tract infection, Satellite infection, Silent infection, Spillover infection, Sterile infection, Subclinical infection, Superinfection, Surgical site infection, Tap water infection, Tunnel infection, Urinary tract infection. Cf Disinfection. Invasion of the body by organisms that have the potential to cause disease. 1. 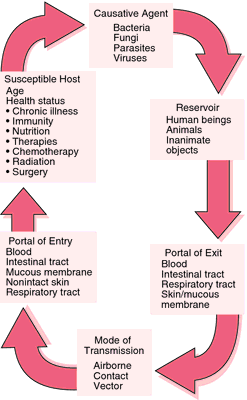 The process by which organisms capable of causing disease gain entry to the body and establish colonies. 2. The state of injury or damage to part of the body resulting from this process. the invasion of tissues by microorganisms with or without disease production. An invasion of the body by disease-producing microorganisms (e.g. bacteria, virus, fungus, parasite). Treatment typically includes anti-infective drugs, such as antibiotic, antifungal or antiviral agents. See inflammation. n an invasion of the tissues of the body by disease-producing microorganisms and the reaction of these tissues to the microorganisms and/or their toxins. The mere presence of microorganisms without reaction is not evidence of infection. n 1. an infection usually caused by Group A hemolytic streptococci. Such infections include scarlet fever, streptococcal sore throat, cellulitis, and osteomyelitis. 2. an infection caused by streptococci that produce a toxic substance (hemolysin) that will lyse the erythrocytes and liberate hemoglobin from red blood cells. Q. Yeast infection in bloodstream How to get rid of yeast infection systemically. A. there are several treatments and medications against systemic fungal infections, yeasts included. but in order to get treated you have to go through a proper diagnosis and a Dr. should check what kind of fungus you are having and prescribe the medication that fits it. me throwing all sort of medication names won't give you anything. this has to be checked out with a blood test and a culture. Q. Is this an infection or pregnancy? I am worried with the white odorless mucus discharge. My hubby and I are also trying for baby. I have browsed the web and found that this could be possible infection also. Is this an infection or pregnancy? A. It’s a cervical discharge and mucus secreted may be majorly a sign of pregnancy. I too had the same symptom but was tested positive for pregnancy. At times it may be a normal vaginal discharge. Generally it will be a yeast infection. Just check for your body temperature changes as it indicates good for you. Your mucus will be like raw egg white, the more thick more chances for positive. Keep a check on these factors. I shall suggest you to visit the doctor to confirm the same instead of making your own conclusions.